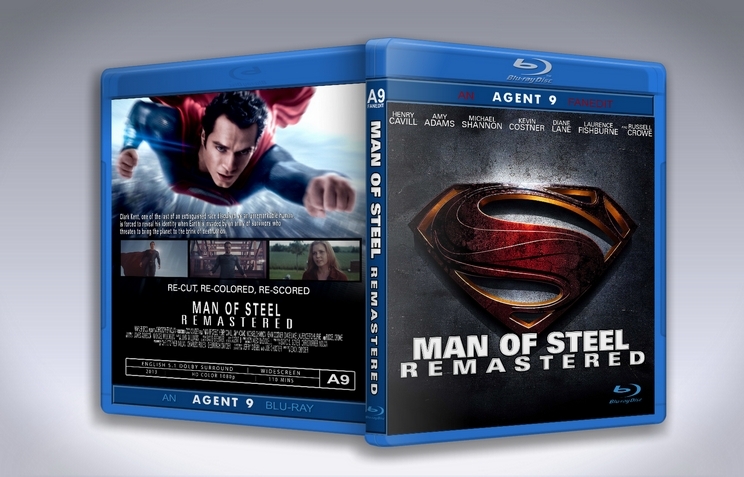 Re-Cut, Re-Colored, & Re-Scored = Remastered. 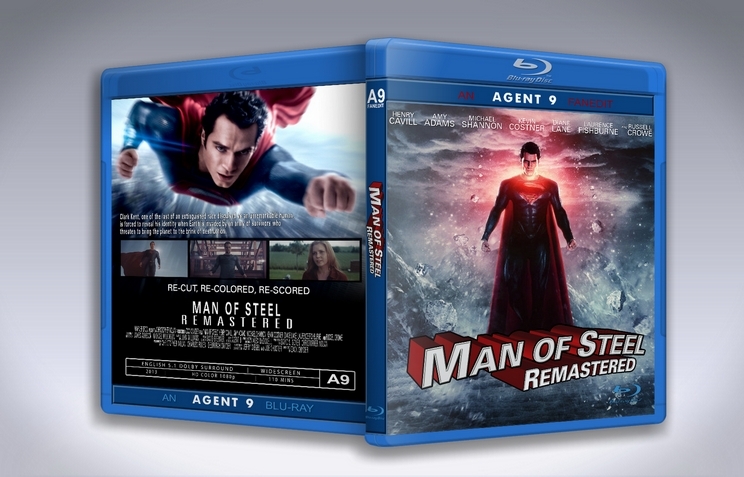 While I liked the Hanz Zimmer score, it still didn't feel like Superman to me, so I re-Scored the entire film with the John Williams Score and re-cut the film in a more traditional fashion, trying the best I could to match the original 78' Version, and also got rid of the sickly green overtone carried throughout the film. Because of the Removal of the music, an entirely new 5.1 Dolby Digital track had to be redesigned. Which will include new Sound FX, new Ambiance etc.. while some Sound FX have also been replaced in order to enhance them, especially Superman's takeoff's. - New VFX: Removed the drone from certain shots aboard the Scout Ship. - In this Version the Codex is the Command Key. It is no longer in Kal'El's blood. - "Any mention of being born naturally etc." - When Clark comes home – 2/3 of the scene has been cut. - "I let my father die.."
- "...yada yada yada.....flack jacket...."
- "as for my rescuer............."
- "...yada yada yada.. visit an old friend"
- "I can't print this Lois you may hallucinated....."
- "...yada yada yada..Ive fought these people before"
- "If you destroy this ship, you destroy Krypton"
- "Krypton had its chance"
- "My soul is what you've taken from me"
- Lois's search for Clark happens after talking to guy in bar. - Placed Bus flashback after Lois talks to Pete. What a difference a soundtrack makes (plus some re-colouring)! I originally saw the original in 3D which was migraine inducing and as such have never been a huge fan of the movie. There were elements I enjoyed but I felt it lacked the element of hope that Christopher Reeves movies had, and hope is such an important element of Superman for me. 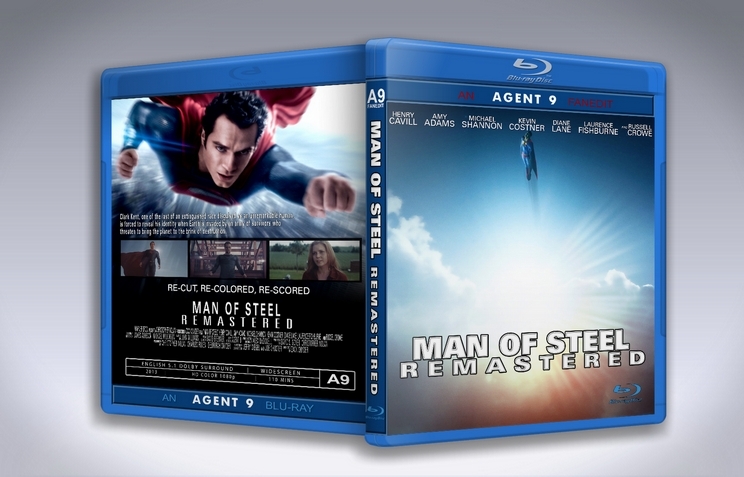 Hans Zimmer's soundtrack was perfectly fine for the theatrical release but by adding John Williams score and re-colouring you have helped me find hope in the Man of Steel again. The only drawbacks for me stem form the original narrative which you have done a great job working with - thanks! OMG!!! This just blew my mind, it was an excellent experience watching this edit. I felt as watching the old structure of the movie with a new take, it was just fabulous. 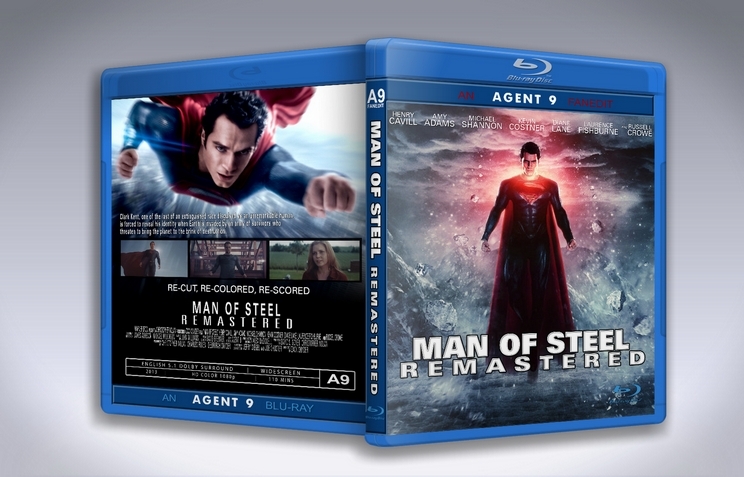 I loved everything about it, definitely my favorite edit of Man of Steel, I loved the color grading and the transitions with the music, also the whole structure, watching a more toned down, more heroic and less violent Superman is a great thing. 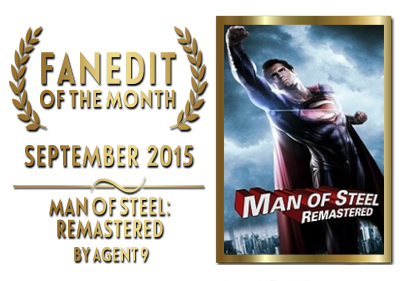 Congratulations Agent 9, this is by far a great view of The Man of Steel. A MUST WATCH!!! I cannot review it as a professional editor, but as a fan I enjoyed this edit a lot. A lot! The pacing of the movie is so much better, the new color and score sets other mood for it. 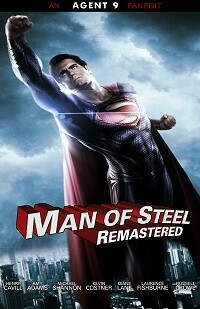 It makes the film much more enjoyable, as a real superman movie. It gave me chills, it made me smile every time. The dark endeavor gives place to a light hearted and way better storytelling. I loved this so much. 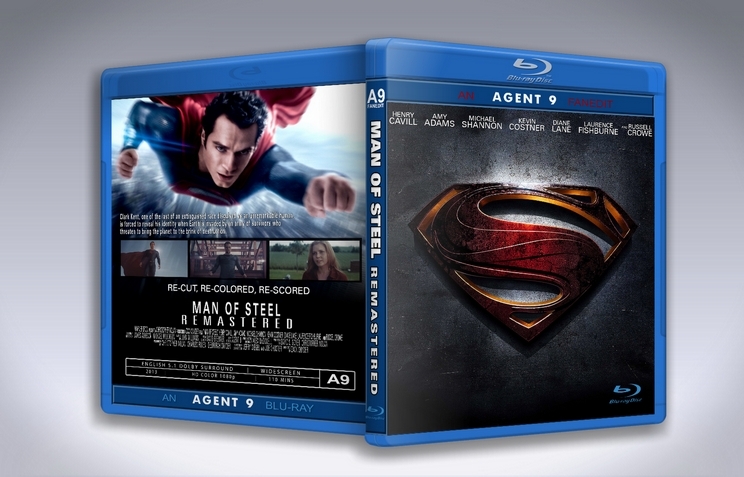 Man of Steel Trailer #3 is my favorite movie trailer of all time, but Man of Steel the film was in many ways a disappointment. The pacing was laborious, the storytelling muddled and unevenly executed, and the action scenes exhausting. 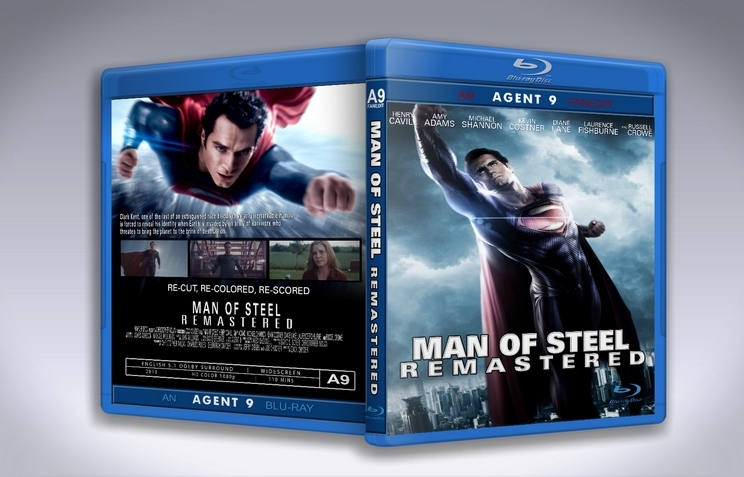 While this is not the definitive edit of Man of Steel for me (As far as I'm aware, that edit doesn't exist yet), it's a really strong alternative way of viewing the film, especially if you had no love for the original. The strongest points of this edit are pacing and economy of storytelling: The Krypton sequence is fast and furious, replacing the exhausting ordeal that was the original. The focus on Lois Lane toward the beginning of the film and the re-purposing and reordering of the flashback sequences was a revelation. The action is trimmed down to a more manageable length. Overall the film feels much more confidently told and was able to grab and hold my attention, unlike the original. Also, one of the most maligned scenes from the original film, Pa Kent's death by tornado, is thankfully nowhere to be found. However, there were also aspects of this edit that did not work for me. The new color grading is mostly great but sometimes looks a little bright and oversaturated, like it's trying to overcompensate for the darker colors of the original. The original film had beautiful high-contrast cinematography which sometimes gets a little washed out in this color grade. kk650's recolored version of the original MOS tones down the grungy green grade while still playing to the strengths of the original photography. The John Williams score is cool as an alternate take on the film, but in my opinion it does not really fit as well as the Zimmer score. I am probably in the minority here, but I prefer Zimmer's score to Williams, which was great in the original Superman but it's trumpeting brass and triumphant fanfares sound out of place here, whilst Zimmer's booming percussion and minimalist piano did not. The opening credits sequence also plays way too long for a modern film. Lastly, I feel that some of Agent9's edits serve to bury some of the themes of the original Man of Steel rather than trying to salvage them. Particularly Clark's anxiety over humanity fearing and rejecting him is still here but is weakened by the removal of the Church scene, and the Williams score does more to hurt in this area, making scenes sound triumphant that should be more pensive. I also think a flaw in the original film that ought to have been addressed by the editor is that Superman dons the suit and takes flight before he's committed to revealing himself to the world. It could have been a truly earned moment but it feels like the film blows its load too early. I know it might be a bit strange to have Superman travel back to the arctic after he's returned to Smallville, but I think this could have been accomplished by splitting the the scene between Clark and Jor-El in two. The suit reveal could have been saved for later. 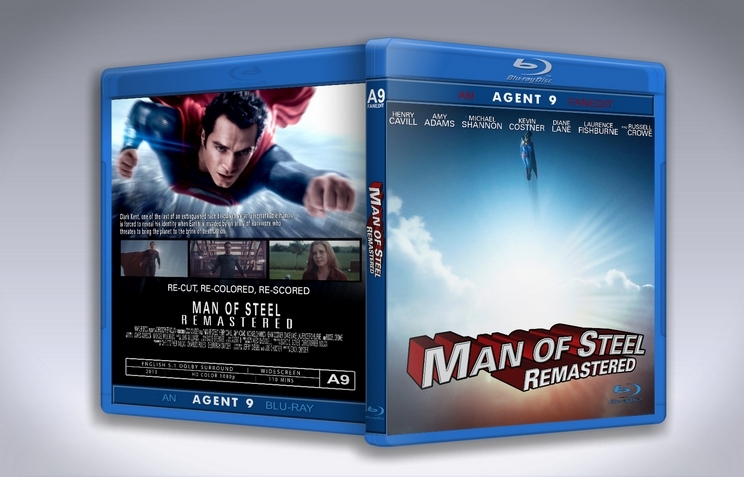 First time I saw Man of Steel, I loved it, as was the case when I first bought it on blu ray. But, the more I watched it the more its flaws started to wear and tear at my enjoyment, especially with it's ugly color grading. While I still don't hate the film or call it god awful, this edit here is spectacular. First off, addressing the coloring, I can now say "Man of Steel, in color." Easy on the eyes and very bright like it should be. 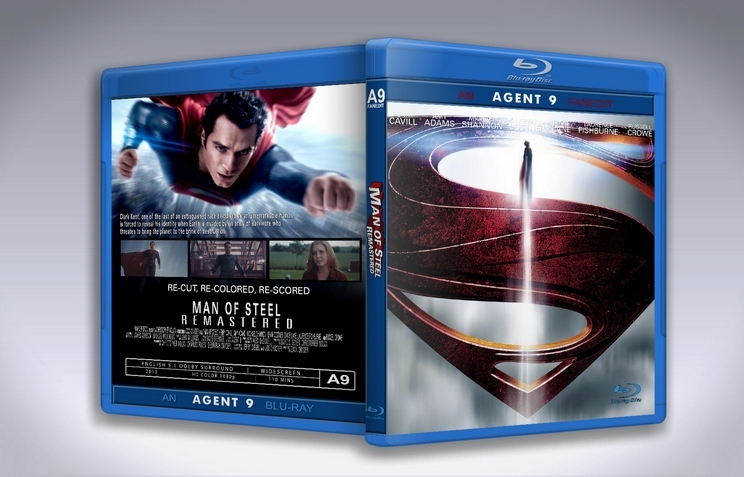 The pace, my gosh the pacing is much closer to a traditional Superman film and never bored me. The cuts all made sense, were creative and the added shots from other sources fitted in nicely. Same with audio, although once or twice you could make out transitions from the original cut, it never bothered me. This is a must add to your Blu ray collection.